The print is typical of the etchings made from 1580 to 1750, but not always with so much of the plate worked as we see here. Most portraits are no larger than this. Hollar was born in Prague, 'discovered' by the Earl of Arundel (a patron of the arts,) and brought to England, spending most of his working life in London. Most of his work was sponsored by the Earl, but he did a lot of work for various publishers and produced a wide range subjects, including important views of London. 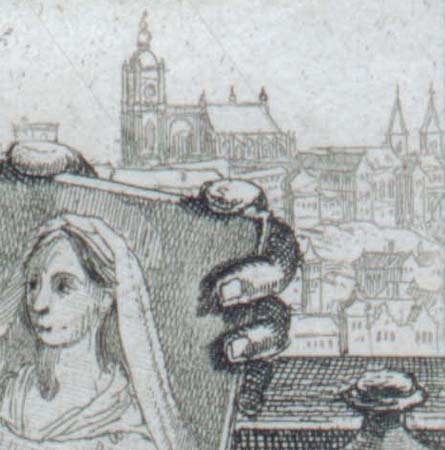 In the print, Hollar is seen with a view in the background which is typical of his own work. In his hand is an etched plate; the writing at the bottom can be clearly read, though in reverse, 'Raph Urb. 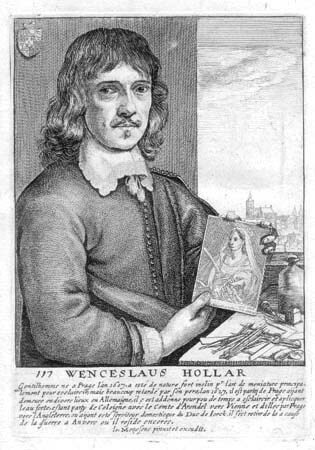 W. Hollar fecit. Ex collection Arondelle,' which means the portrait is after Raphael of Urbino, etched by Hollar, in the collection of the Earl of Arundel. On the table is a variety of etching tools and an acid bottle.